Another fun-filled animated film from DreamWorks Animation, "Home" explores the value of friendship, love and family. The film captured the cute and comic antics of the Minions from "Despicable Me" and a hint of "Ohana" from "Lilo & Stitch" perfectly. The limited number of main characters in the film helped in fully-developing the characters of Oh and Tip. The picturesque global chase and adventure around the world is fun and exciting. The music used in the movie is very hip and enjoyable, it added extra fun to the scenes (Having Rihanna in the voice actors surely is a plus for this film). I enjoy the way the Boov are animated and how their color changes parallel to their emotional state. The jelly-like and squiggly form and movements would surely make kids giggle. Pig, the cat would surely be remembered as the cute fat cat that vibrates. Tip's movements and reactions are very human-like and impressive. Even though there have been some parts that are a little flat, over-all the movie is good. 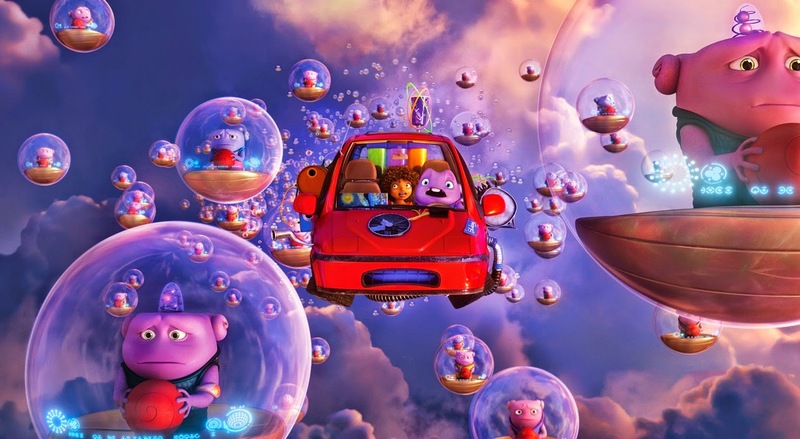 “Home” takes a friendly alien race known as Boov towards Earth where they use the planet to hide from a long time enemy. When Oh (voiced by Jim Parsons) accidentally notifies the enemy of their whereabouts, he was suspected to be siding with the enemy and tries to run away only to cross paths with a teenage girl named Tip (Rihanna). Starting off on unfriendly terms, Oh and Tip embark on a comical adventure to correct the wrongs where Oh eventually learns what it means to be human. “Home” takes Oh, Tip – and the audience – on a worldwide journey, from the United States to France to China, and finally to Australia. It’s an epic expedition encompassing millions of Boovian spaceships, and technology that switches off gravity across the entire planet. An enormous Gorg mothership also lends impressive scale. Music icon Rihanna stars in her first animated voice role in DreamWorks Animation’s “Home” along with the multi-talented Jennifer Lopez as they play mother-daughter role where their singing voices can also be heard in the movie’s upbeat and endearing songs about family and friendship. “Home” (2D and 3D)opens in cinemas this March 26 nationwide from DreamWorks Animation and 20th Century Fox to be distributed by Warner Bros.